Jonathan Carroll (Cack) Howton married Martha L. Parsons in Feb 16, 1859. Martha L. Parsons married Jonathan Carroll (Cack) Howton, son of Lewis Howton and Harriett Whiteside, in Feb 16, 1859. Nell Deaton Franklin married Charles D. Mansfield Houghton, son of Major Albert Charles Houghton and Amy Alvira Twitchell, in circa 1922 age 27 and 19.
Notable 1975 The Evans Houghton Award is the highest form of recognition bestowed by the New England Society for Healthcare Communications. Created in 1975, the Evans Houghton Award was established by the Society's Board of Directors to honor the memory of Evans F. Houghton, one of the Society's Founders. 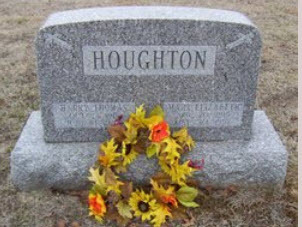 Houghton served for many years as a Director/At-Large as well as Chairman of the Placement Committee. Following his untimely death in 1974, the officers and directors established this memorial award. Evans Franklyn Houghton married Ruth Mortensen. James William Haughton married Mary E. (?) in circa 1908 mar 2 y in 1910 census; ages 19 and 23. (?) Faltz married Lela L. Houghton, daughter of Charles A. Houghton and Anna E. Rann, in circa 1927 age 20. (?) Faltz and Lela L. Houghton were divorced. Eva McCabe married Earle Henry Houghton, son of Allen Dan Houghton and Minerva H. Howden, in circa 1914 age 26 and 28. Rema K. Pick married Carl Roy Houghton, son of Walter Raleigh Houghton A. M. and Alice Margaret Neely, in circa 1927 age 47 and 35. Sarah Brit married Carl Roy Houghton, son of Walter Raleigh Houghton A. M. and Alice Margaret Neely. James Avard Houghton married Ida M. Lawler in circa 1902 age 30 and 23. Ida M. Lawler married James Avard Houghton in circa 1902 age 30 and 23. Charles B. Houghton married Dorthea L. Timberlake in May 21, 1932 at Jeffersonville, Clark Co., IN, USA. Harry Thomas Houghton married Mary Elizabeth Soergel.